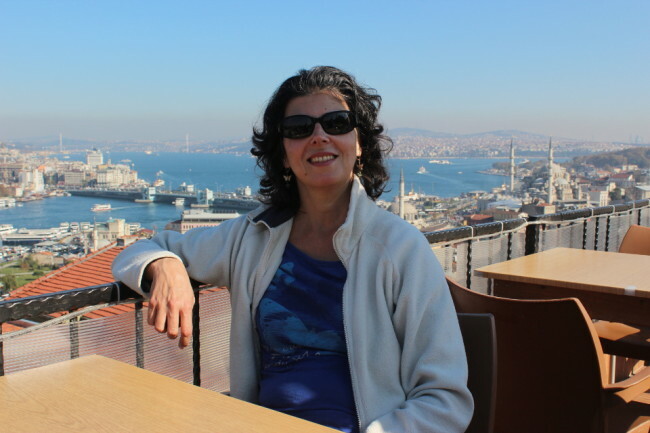 My first visit to Istanbul in November 2014 left me wanting more. I felt safe as a solo woman in Turkey. The main thing that stopped me from exploring further was the time of year. Heading into late autumn, Istanbul was still pleasant enough, but it wasn’t the best time to visit the coasts or interior of the country. Turkey is actually pretty easy to travel to. Turkish Airlines, its national carrier, flies to 304 destinations in Europe, Asia, Africa, and the Americas, more destinations than any other airline. And if you normally book your own flights, you may have noticed that it’s often the cheapest carrier. Even though most nationalities (including Canadians, Americans, Brits, and Australians) require a visa to enter the country, you can now easily get your Turkey visa online. Cappadocia is at the top of my list when I return to Turkey. According to Lonely Planet, visiting this land of fairy chimneys and fantastical rock formations is like landing on another planet. Its cavern architecture and rock-cut churches remind me of Matera in Italy, while the geology brings to mind the hoodoos of Kasha-Katuwe in New Mexico. And just like in New Mexico, people can fly in balloons over the landscape. Natural beauty aside, this region is also known for its numerous valleys cut by hiking trails, such as the Rose Valley and Ihlara Valley. I just love day hikes! Other top attractions include the Göreme Open Air Museum (a Byzantine monastic settlement of rock-cut churches) and the underground city of Derinkuyu, built on seven levels. I think one could easily spend a week in Cappadocia and not get bored. 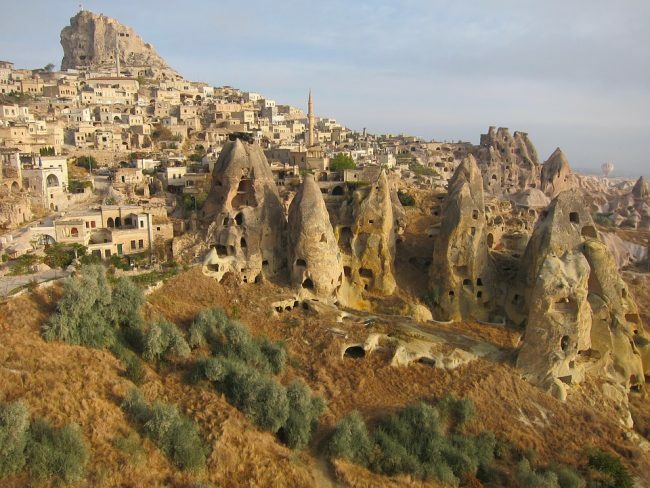 Göreme is the main town in the area and offers stays in cave hotels. Ephesus, near the Aegean Coast, was an ancient Greek city that later became the 4th most important city in the Roman Empire. The ruins that remain are a UNESCO World Heritage Site and are hugely popular. Guidebooks recommend visiting it in the early morning or late afternoon to avoid the crowds. Even with only 20% of the site currently excavated, this is one of the largest Roman ruins in the world, covering an area of 4 square kilometres (1.5 square miles), and a visit will require some planning. 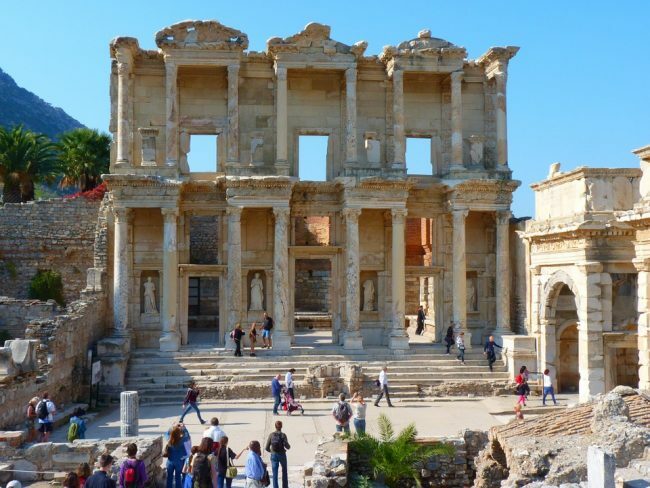 Looking at photos, Ephesus will not disappoint with its classic monuments of beige stone surrounded by a sun-drenched landscape of pines and olive trees. The closest town is Selçuk, which makes a good base. There are other sights to visit nearby, such as the Ayasoluk Castle, the Basilica of St. John, and of course the last remaining column from the Temple of Artemis, one of the seven wonders of the Ancient World. Pamukkale in southwest Turkey looks just so wonderfully weird and enticing. Its name means “Cotton Castle” in Turkish. 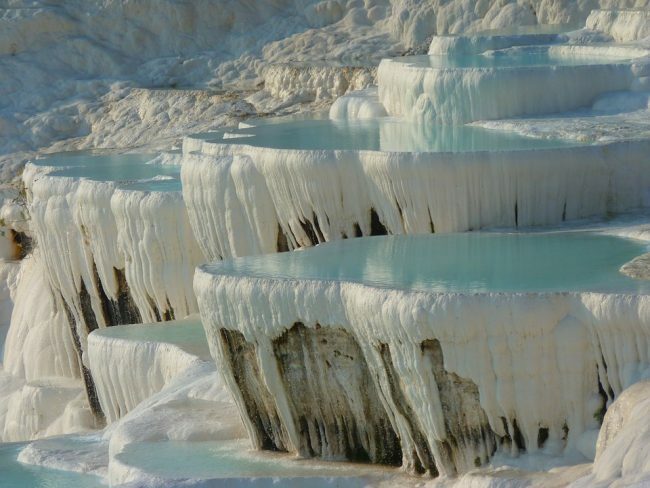 Consisting of a series of mineral-rich thermal pools, the dazzlingly white calcite terraces remind one of melted candles. Since it’s a UNESCO World Heritage Site, you can’t wander everywhere, but you can still walk and soak into some of the pools. Nearby are the ruins of Hierapolis, an ancient Roman and Byzantine spa city. The ruins and terraces are part of the same National Park and can be visited on the same ticket. Spending the night in Pamukkale village allows you to arrive at the site early, before the day-trippers descend. Although I’m quite happy travelling solo, I can’t help but think that experiencing the pools of Pamukkale would be more fun with a friend. The stretch of Mediterranean coast between Antalya and Fethiye bears the dreamy moniker of Turquoise Coast, because of the blue-green shades of its sea. There are resorts and beaches galore along this stunning stretch of coastline backed by pine-forested mountains. It’s also home to the Lycian Way, a 500-kilometre footpath that meanders among ruins, rock tombs, and ancient cities such as Xanthos and Arykanda. Hiking along a section of the sunny Lycian Way would be fantastic. Deciding which section to hike will require some research and may also determine the best place to base yourself. 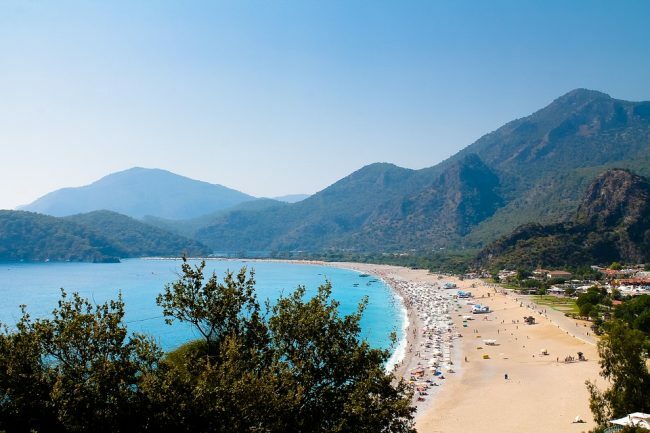 You could stay in the large resort town of Fethiye, Patara for the best beaches, or Olympos, a quirky village south of Antalya, among others. Besides hiking and enjoying the beach, you can also enjoy a day trip on a gulet, a traditional wooden sailing boat. Or you could try parasailing over the lagoon in Ölüdeniz, which is something I have yet to cross off my bucket list. And this rounds up the four amazing places in Turkey that I really want to see next time. I hope this article has inspired you to look beyond the newspaper headlines and consider the beauty and variety that Turkey has to offer. And since you’re likely to arrive via Istanbul, here is how I spent my time in the capital city. In fact, now would be the perfect time to start planning a spring trip!